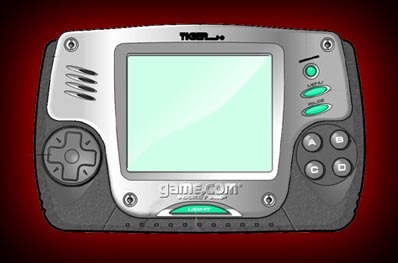 It's not so strange and rare (at least in North America...) anyway since it is a great system without much support from fans I decided to include in my site a page dedicated to this portable system from Tiger Electronics Inc.
Actually the system is still sold by Tiger together with some of the new games but its future is not very clear: new games and versions are not planned right now and further plans of Hasbro about the videogame market are unclear! This system was released in the middle of 1997 in the US (maybe also in Canada but I need a confirmation) and after few months also in United Kingdom that is the only European country in which the system is actually marketed. If you don't live in the countries I mentioned above it is very difficult to buy the system: I had to wait more than a year to be able to play with my game.com and I had to order it directly from the UK! Anyway it was I did not wait for nothing: the system is excellent and I have to admit that it is much more better than the various magazines say. The system as it was advertised on a US magazine (GamePro). You could easily spot the stylus that is used with the revolutionary touch screen: it is also possible to use your fingers instead but I am not sure it is the best way to operate the system! Another image of the system. If you take a look at the screen you could see the start-up menu divided in six different sections. Function One: Cartridge. Used to activate a cartridge once it's been inserted. Since the game.com has two cartridge ports, if two cartridges are inserted, the system ask you which game you want to play. Function Three: Calendar It's a calendar, nothing more... you can view any month from 1901 to 2099. Function Four: Calculator A simple but extremely useful calculator. Function Five: High Score Saves the single highest score from each of 12 games (the instruction booklet says 10 but actually I reached 12). Function Six: Solitaire A built-in free game: the classic Solitaire. Another revolutionary aspect of the system is its ability to have Internet/email access as an optional: with a proper cartridge (Internet Cart) and a dedicated 14.4 BPS modem you could easily check your mail and also surf the net: you could only view text-only sites but it's something unusual for a portable videogame system! In the pic above you could see the menu from the Internet cart. Another Internet-related cart is also available: the Web Link cart let you connect the game.com to a PC to exchange datas from and to the official web site (www.game.com). These accessories are not easy to find in stores anyway. Actually a new, better version of the game.com called game.com pocketpro is on the market: the new version is much smaller and has a new good feature, a back-lit screen. The new version lacks of the second cartridge port. Since it was announced the first version of the system was better known as ClassiCom by supporters. I'll soon add a better pic of the new system: for now here is an official drawing of the system directly from Tiger. A game.com cartridge: they are very small, in fact they are the smallest carts ever made for a portable system! Actually there are nearly 20 games for the system but Tiger has nearly 10 games in development that will be marketed before the end of next year. The European situation is not very good for the system: it is marketed only in UK and over there is not advertised in a good way... Also all the magazines that reviewed the system gave it a bad review I hope that since Hasbro acquired Tiger the situation all over the world (and in particular in Europe) will be better in 1999. The system has a great potential and I am sure could give owner many good games if only Hasbro will support it with more interest.